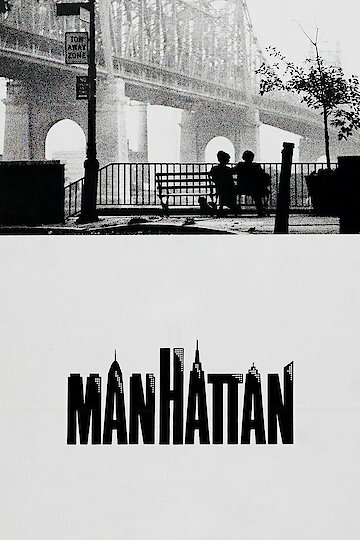 Manhattan has an all star cast of Woody Allen, Diane Keaton, Meryl Streep, Mariel Hemingway and Michael Murphy. This is an artistic black and white film with some of George Gershwin's best music. Rhapsody in Blue, Sweet and Low Down, I've Got a Crush on You and Embraceable You, play in the background with dramatically photographed skylines of Manhattan, New York as the backdrop. The story is based on a writer who is twice divorced. The latter wife, Meryl Streep, becomes a full time lesbian, living with her lover. She is also writing an intimate book about their marriage, which deeply disturbs him. He writes for TV and is experiencing a midlife crisis. He is also having a love affair with a 17 year old high school student, Mariel Hemingway, and finds himself in conflict with the 17 year old, who adores him, and his best friend's intellectual and opinionated mistress, Diane Keaton. With his best friend's blessings, Woody and Keaton began to fall in love and he lets his high scholar go. But, just when everyone is romantically and emotionally in the right slot, there is more conflict and confusion to follow. Manhattan is currently available to watch and stream, download, buy on demand at Amazon Prime, HBO NOW, Amazon, Vudu, Google Play, FandangoNow, iTunes, YouTube VOD online.